Beyond ordinary HDD enclosure with routine design and looks, the ICY DOCK Blizzard MB080U3S-1SB brings a new breeze by incorporating alien exterior, unique cooling mechanics and an array of thoughtful features. What impresses you at the first sight is the diamond-shape front panel housing an 80mm fan to produce one-direction, straight air flow. The front panel can be easily removed to expose the drive, together with tool-less HDD installation, you can use this enclosure as docking station for quick HDD swap. USB 3.0 & eSATA dual connectors facilitate the hookup to various devices, with blistering data transfer speed. 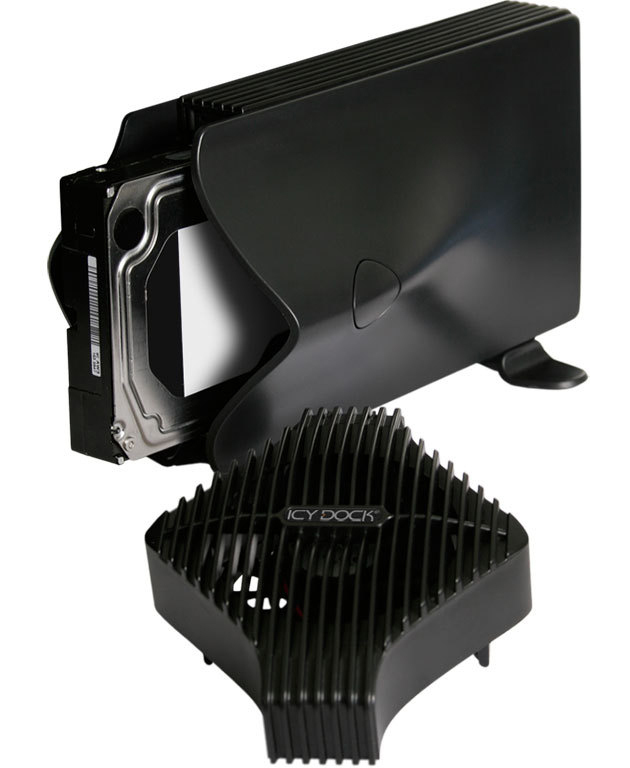 The fan speed and ambient LED brightness can also be adjusted to your liking. When the HDD temperature exceeds 50°C, the LED light changes from blue to red to warn you - the hard drive failure or malfunction associated with overheating are things of the past.